We're back home from the holidays and taking it E-Z! Clementines...these hybrids from tangerines and mandarin oranges were a big hit for our family over the holidays. No one from my husband's side of the family had seen them before...I'd just learned about them a couple of weeks before. Super juicy and sweet with NO seeds...nice. 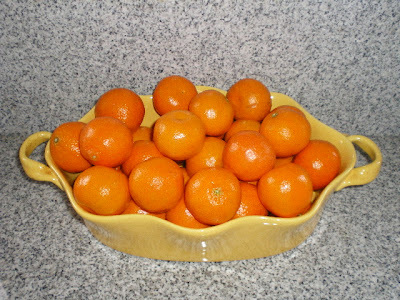 In this photo they are are piled high in my new casserole dish. 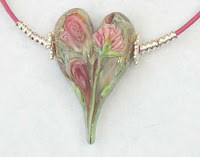 I'll be focusing on prepping personal income tax info amidst designing lots of heart jewelry for Valentine's Day. You HAVE to come see my awesome heart that is on its way to me today...it's called Shrouded by Payton Jett. It's on my home page at www.RockerJewlz.com. Yep, it's still autumn...well..today is the last day, ha ha. 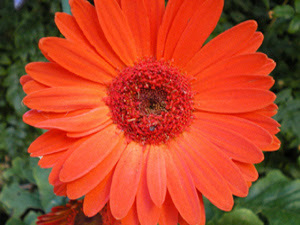 So I'm providing you with a final blast of autumn color from the zinnea in my front yard...ahhhhhh, nice. 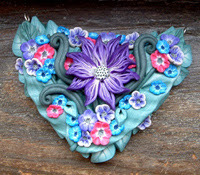 I got ZudaGay's polymer clay pendant featured in December 14th's blog. It is sooo awesome! Seeing it 3d and in person provides a level of detail a photo just can't capture. It will be so fun to work with it. I also ordered the custom one you see above...blues, purples, and pinks are my favorite colors for my wardrobe. Only four days until Christmas, gang. I have two gifts left to work on as they are handmade. I'm glad I left them until now instead of leaving shopping to the last minute. Oh, broken toe update (see Dec. 18 blog)...feeling MUCH better but I'm still being careful and hobbling about! Quote for today: "It is necessary to have unnecessary things"...from the film "Life is Beautiful". So pretty. I just listed this on Etsy (username: rockerjewlz) and better make one for myself! I'm going to be featured in a cake blog soon...I'll let you know when it's available. I read some of my past blogs and need to tell you that the Red Velvet and Chocolate cupcake bracelets will be ready for Valentine's Day rather than Christmas. But, if you need any custom pieces before then, just let me know. Well, as hard as it is for me to believe, my "baby" turned 20 today! No longer is there a teenager living in my home. Wow...just...........wow. He's my one and only child with a heart of gold, a slim and trim physique and fabulous face...what a wonderful person he is! Still drives me crazy sometimes, but once he's out on his own, he'll realize how great he had it here...and he'll be back to tell us so! On a different vein, I busted my toe last week! Slammed it into a nearly invisible wooden sofa leg and I mean I really slammed it. It hurt more than just a stubbed toe, but I didn't think beyond that...then, I wasn't concentrating on protecting it when I was walking around a few days later...and I took a step like I normally would, and it felt like I'd bashed it all over again. With parties, holidays, LOTS of family birthdays and Christmas prep, time went by and today it hit me that tomorrow is 10 days since I first injured it...geez, I canNOT believe that much time went by. I was lucky to get into urgent care today and x-rays showed there was indeed a break in the center toe of my right foot. Doc says 3 weeks is the usual recovery time and I'm already a third into that, so I taped the toe to it's neighbor for stability and I have a special flat and stiff sort of sandal thingy to keep my foot in a proper healing position. So, all in all, not too bad. I only needed Advil that first night and I can get around...it's just exhausting after a while to hobble about. I'll just have to get photoged from the knee up for Christmas photos! The xrays were really cool...had to go to a different building for them and when I returned to the doc's office, he pulled them up on his computer...bam, there they were on the monitor...how cool is that. Technology just keeps getting better. In contrast to technology, on the handmade jewelry front, I'm ordering special pretty hearts for valentine's day to add to my pretty hefty heart box...I'm going to have fun pumping out Valentine's Day jewelry! Stay tuned and Merry Christmas as well as Happy Holidays. I discovered these Japanese Tensha lucite beads on Etsy and just had to have them. I got 5 different color combos. These to the left look very Victorian to me and I LOVE anything Victorian. I wouldn't have wanted to live in those days due to the lack of women's rights, having to wear corsets and pumping water, but the depth of detail in the rich textiles, color, art and architecture just fascinates me. I don't think any other era can top it in so many venues across the board. 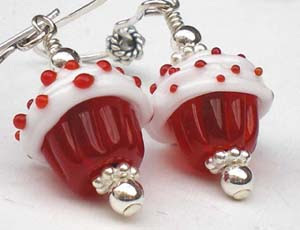 As for jewelry, I've focused on lampwork and silver and now need to branch out. A year ago I would not have purchased lucite...I wanted to keep the jewelry purely the top notch materials. But now I'm leaning towards a bit of kitsch here and there and lucite fits the bill. I've discovered a polymer clay artist on Etsy...ZudaGay. She created this awesome pendant. I'm sure it's too elaborate for some people, but it took my breath away. I've requested to have the same design in deep jewel tones...just for me! 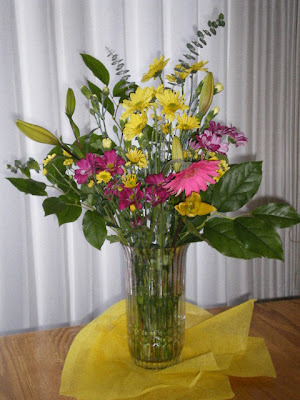 So tell me what you think: blue, purple and pink in the flowers with a deeper teal background? It's going to be gorgeous! This is a biggie, about 3.5 inches wide. I've been noticing on t.v. and movies that pendants are absolutely gigantic these days as well as really large beads in necklaces so ZudaGay and I are right in step. Large, unique jewelry is the style I envisioned when I began RockerJewlz but I've long been in a very simple design mode...refined is a word a friend used recently for my work. I think it's because I was trying to pump out as many pieces as I could in a short amount of time to get noticed. Now I need to move into the world where I lose myself in design and create big, wild pieces that speak to one's soul. There will be plenty of time for that between now and summer when shoppers will once again splurge on jewelry! So, lots of hearts will be coming for Valentine's Day, and the rest of the time will be spent gaining exposure and designing, designing, designing! Another awesome bead by Payton Jett was requested specially by me for my sister in the music biz. See the little music notes? The colors are just spectacular in Psyche and Silver Plum glass. Purples, blues and greens are present and I set it up so the bead spins freely. On Etsy, my Purple Drama bangle bracelet had over 200 hits in one day on Monday!!!! It must have been in someone's treasury that was featured, thus it would have been on the home page of Etsy and highly visible. That was exciting...never had that many hits before. As soon as it gets too late to send purchases by Christmas, I'll be focusing on marketing strategies to gain more exposure for RockerJewlz and making lots of snappy Valentine heart jewelry. I bought a lot of lampwork hearts this year and they range from cutesy to total drama, so I look forward to seeing which ones become most popular. I'm enjoying sunshine in the San Francisco bay area today although the temps are very cold for us...sometimes not above 50 degrees. When you live where it never snows, that is a LOW temperature, gang! 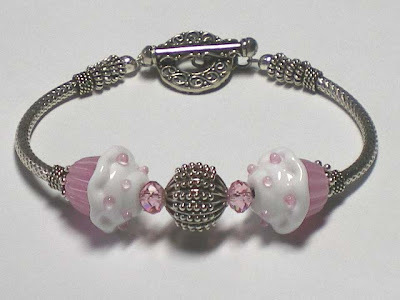 Once again, Payton Jett makes such beautiful beads there's little reason to enhance them. 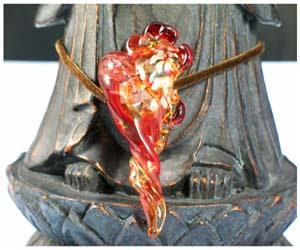 These are my Ornamental Reds, available on Etsy under the username RockerJewlz. I realized today that since I'm going to my family's annual Christmas celebration that I had to hustle to get some jewelry made! Each year, my side of the family gets together a couple of weeks before Christmas. That way we can all make it and then spend the actual holiday with in-laws. It's something we've been doing over 30 years and it's a wonderful tradition with silliness, seriousness, gifts and food. Oh yum, 5 of us kids each bake one specialty my mom used to make all by herself each year. Now that she's gone, we keep these treats coming because that's what is desired more than the gifts! All that's left now is wrapping gifts and packing the car...and oh...um...oh yeah...sleeping! I'm the designated one to get to the party house early and help set up. My sister and her family always do awesome decorations so it will be fun to get in on that. So, I'll be back Monday and have 2 cupcake bracelets in mind...one in chocolate caramel and the other in red velvet...again, all by Payton. Ain't she grand? 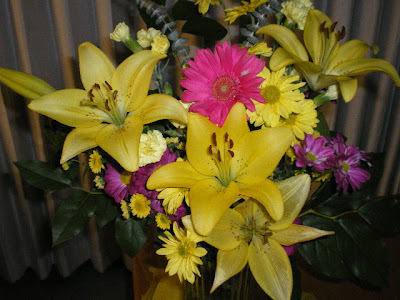 I just had to update you on my birthday flowers...there are now 4 out of 5 lilies that have bloomed...so pretty! 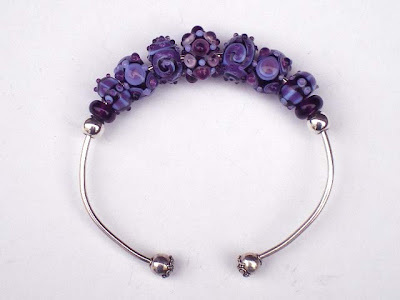 And now.....these beads from GlassValley Melanie are deep and rich in purples and didn't need ANY embellishments. I kept trying to add silver and spacers but it was always too much so I just kept it all beads with a couple of smart silver beads to keep it all in place. The .925 sterling cuff has beautifully detailed ball ends. Just a lovely piece. So keep coming back as I plan to add a good half dozen items...and they aren't all cupcakes! 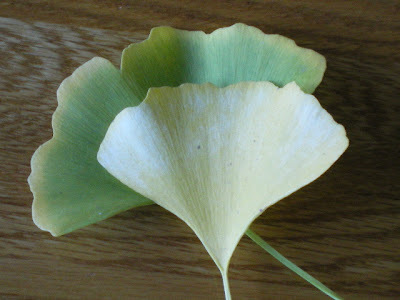 I do believe these are gingko baloba leaves. 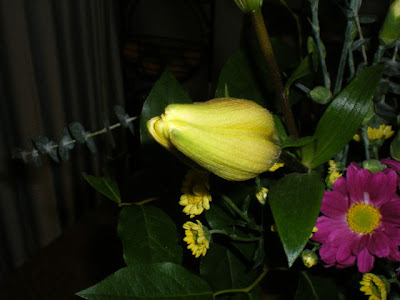 A good friend has convinced me that she and possibly others wants to hear more about my personal life in my blog. 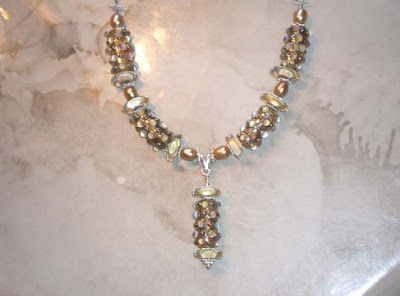 When I started this blog I was determined to keep it business oriented regarding my jewelry as I'd seen blogs that slowly got so personal they rarely had bead and jewelry tidbits...which is what I was looking for. I'll add a bit of personal stuff but want to keep it balanced with RockerJewlz goodies, so we'll see how it works out. Let me know what you think. So, for today, I was taking my nearly daily walk (cough, cough) and was stunned by this amazing tree with nothing but yellow leaves on it. Didn't have my camera so I brought these two home. I was surprised that some of the leaves had so much green in them and that the yellow one, if you look reeeeaaaal close, is speckled with white. The result is that from a few feet away, ALL you see is yellow leaves on this tree. Interesting how color works. Speaking of which, I recall being awestruck by a photo of a Rembrandt painting in a book. The closer I looked at the painting, the more detail I noticed. At one point, I was so close I could see the brush strokes and then noticed very weird colors in the cheek of a woman's face. I saw brown, yellow, green....not much in the tones of what we think of as skin color. I thought, oh come on, there's no yellow or green in Caucasian flesh...but as I panned back slowly from the photo suddenly all I saw was the natural flush of a woman's cheek...it was amazing it took so many colors to create the tone of human flesh. Now, onto business. 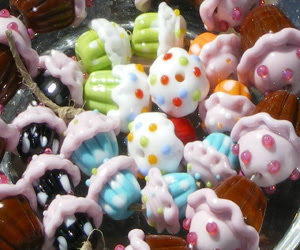 I got the most spectacular beads this week from www.GreenGlassCafe.com...lots of big hearts among them. You won't see them for Christmas gifts but they sure will WOW you for Valentine's Day! I'm working on three custom cupcake orders today and then have to hustle to get a few more items onto Etsy for Christmas. 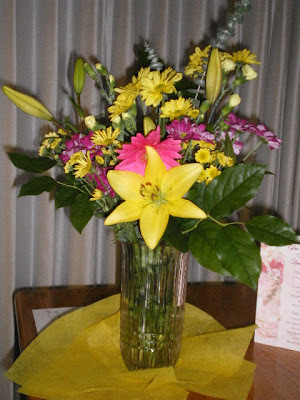 As I bid you "adieu" here are some photos of my beautiful birthday flowers from my husband on Monday. Let me tell you, he starts work at 5:30 in the morning...he went to a 24 hour grocery store to buy them and placed them in a vase before he went to work...what a guy! 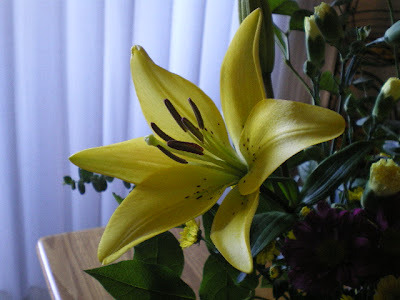 One lily opened the next day...the other photos are the bud of the second lily that just began opening today...it isn't quite fully open. p.s. so what do you think of this blog compared to the past ones? 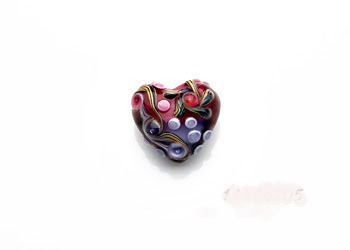 I just received this amazing heart bead and am closer to beginning to expand my design style. This one just aches for feathers so I have to decide if it is to be a necklace or brooch. I've recently begun to get a little bored which is good because it means I'm on the cusp of breaking out into new designs and that is incredibly exciting. So stay posted for a whole new world from RockerJewlz! I'm listing most of my new work on Etsy so be sure to visit me at rockerjewlz.etsy.com. 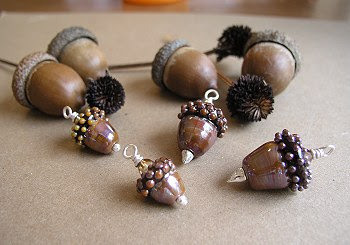 Aren't these glass acorns pretty? They surely don't look like glass. The acorns at my sister's home are falling off the oak trees, so this is a good way of keeping them around just a little bit longer. 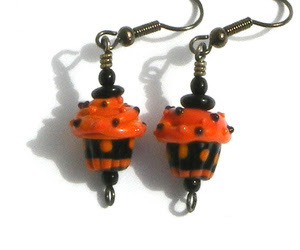 I've been photographing lots of cupcake earrings and other jewelry to post on my Etsy site and just updated www.RockerJewlz.com. We'll see how holiday sales go. So, just keeping busy. Let me know if you have any custom design requests. If I can use what I have in my inventory, that will make the delivery time for your Christmas gifts totally possible. 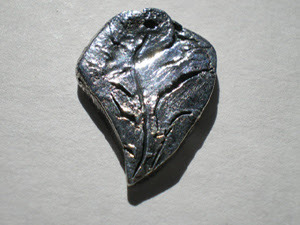 Yay, my first piece of silver from precious metal clay! This was an interesting process. I felt this and the two other designs seemed awkward and clunky until I put a patina on them that blackened the crevices. Now the finish looks somewhat like polished nickel and it changed a the look of a tiny heart enough for me to feel proud to include it as the danglie on a Christmas ornament. It all turned out better than I'd hoped so I'm on my way, in fact, I think I'll keep the leaf you see here for myself. I'm having fun on Etsy, a site where every item must be handmade in order to be posted for sale. Come on over and see my little shop. If you don't find what you need on www.RockerJewlz.com, you'll probably find it on Etsy! I received my 2 books on learning how to work with metal clay in order to produce silver pieces. I'm so excited! It looks like it will be a lot of fun. I still await my torch, the clay itself and some special tools. A small investment for releasing my creative urges. It will be awesome to add silver to my bead stash to help you display your own special flair with RockerJewlz jewelry designs. What a team we will make! As I mentioned in the past, I've discovered that I'm working backwards in developing jewelry lines. I now understand why business plans are important. I had lots of ideas when I started a year ago and then veered off the path in excitement. Now I find I have to go "back" and learn techniques that will provide a much needed unique flair to RockerJewlz. Time for me to get some book learnin'. I've long had the desire to learn to work with fine silver, so for a while I'll be in school, so to speak. I'm awaiting a couple of books that will teach me to work with fine silver using art clay and am having a rather tough time finding books on Viking or Knit silver. This is an interesting method by which you wind soft, fine silver around pegs and then "draw" it through a series of progressively smaller holes in order to end up with a chain. I also await wire mesh ribbon that will add depth and shape to my creations, so, while I await books and supplies, I'll be mixing in some jewelry to add to www.RockerJewlz.com as well as Etsy but wanted you to know that I'm mainly focusing on the learning for now. Hopin' for an A+ in these areas...stick with me and you'll be rewarded with beautiful jewelry. I feel a change coming on. The artist deep within me is growling to be released and is slowly rising to the surface. I need to slip out of stagnancy and design what my heart and soul guide me to create. Through the suggestion of a dear friend, I've returned to sketching my ideas. I haven't sketched in over two decades and when revisiting past work, was pleasantly surprised at my talent such as the ink dot piece you see here. I also ordered a smooth drawing pad to use with colored pencils. I expect my jewelry designs to slowly become more elaborate and uniquely RockerJewlz in style. I've been producing what I call "safe" designs the past year with small sales to very happy customers. Now I want to reach the jewelry lovers I originally dreamed of...those with a little more flash, flair and style while still maintaining my current loyal fans. Stay with me on my journey. There's nothing like a batch of fresh cupcakes. My glass artist friend, Payton, and I have struck a cupcake collaboration where we put our two heads together to design cupcakes in all sorts of color combinations. We inspire each other and it really gets exciting. Wait until you see what she's come up with for Halloween! We extend our invitation of imagination to you...let us know what color combinations you are looking for and we'll do our darndest to accomplish the goal. It's nothing but fun and we can do it all via email or instant messaging from Yahoo. Come and join the fun and help design your world the way you want it...at least in the cupcake realm. I know, I know, it's too early for autumn! But you must know that I order beads for you way ahead of the season. While you enjoy summer, I'm busily receiving autumn toned goods to be assembled into autumn beauties for you...and so on for each season. So, this is just a peek around the corner for you so that you'll know that when you are ready for autumn, I'll be here for you. 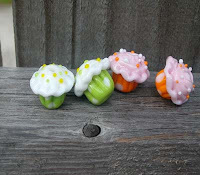 A collaboration has been struck between me and a dear bead artist friend so that we can now provide you with custom colors in cupcake beads! If you can dream it, we can probably make it. It's so exciting because it opens a whole new realm of creativity for you as well as the two of us. We're waiting for your ideas...perhaps a special "flavor" you always like in a cupcake or a creative design atop fluffy "frosting" that is so very "you"...just dream and then tell me your desires. You can see more awesome photos of the "Rainwater" focal on www.RockerJewlz.com by visiting the "Currently in Production" page. 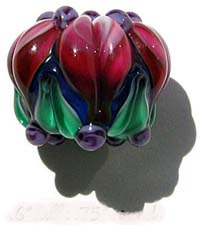 Payton Jett created kind of a soft explosion of color in this glass heart. It's so wonderful, I am keeping it for myself! Well, car trouble kept me from visiting the Sonoma bead show...and it's my favorite one and is once a year. Maybe I would have spent too much money??? In the past few months I lost the thrill in my business and not much was happening because of it. I went back to basics and checked the lists I'd made, noticing that several important organizational steps had never been completed. I had steered off track from my basic plan by trying to follow lots of exciting ideas before I was properly prepared to carry them out. So, I gathered my lists, put them in order and now those ideas are bringing energy and joy back to me as they ruminate in my head once again. It feels good! 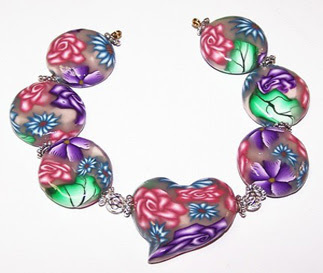 Heart lampwork beads are really catching my eye these days. This beauty is by Grace Ma and was just added to my personal stash but I can order another for you if you like. There's a matching set of lentil shaped beads....kapow! They are awesome. I have another heart by Payton Jett coming up next. Jaw droppingly beautiful. And no, she's not related to the rocker Joan Jett but would gladly make a bead for her any time! 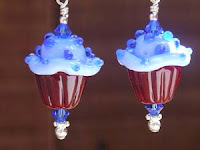 I'm on my way to the Sonoma Wine Country Glass Art & Bead Festival this weekend. (The name is bigger than the bead show!) It's only a couple of hours from home and I'm pickin' up my sis along the way. I love this bead show. It's at the veteran's memorial hall so your entry to the show is outside on the lawn. Free parking, free admission, no gate or door to enter. Just out of car and onto the lawn. Something about not walking straight into a convention hall gets you into a great mood. The perfect weather helps too! 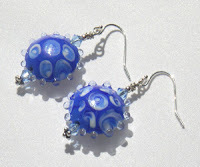 Plus you get to see handmade glass beads sparkle in the sunshine. There are single classes held outside on the back patio and the rest of the show is in two large rooms that are just packed to the gills, but the high ceilings keep even a claustrophobe like me comfy as can be. The building is old so it's got more character to add to the homey feel of this show. What I like best is it is a BEAD show not a gem show. There are a few of those vendors, of course, but I'd say 80-90 percent are selling beads....ahhhhhh, what more could a girl ask for. This is the same show where last year another bead addict and I laughed as we joked that we needed to create Bead Addicts Anonymous. Since it's B.A.A. for short, we could make rounds through bead shows bleating like sheep to find one another to help keep us from overspending! Okay, now that I typed that it sounds JUST a little weird....ya had to be there...ya know? Heh, it still made ME laugh. Wow! What a fabulously shiny set of beads. 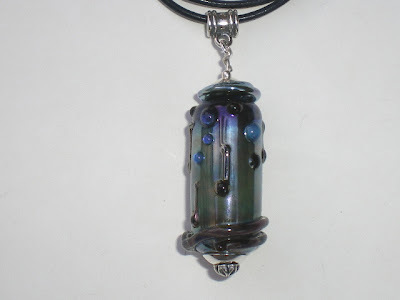 Normally I work with handmade lampwork glass beads, but once in a while I throw in a twist of something new. In this case, it's polymer clay by Chloe's Creations. This color combination just wouldn't let me pass it by. Now I have to decide if it will be a necklace or a bracelet. I've been cleaning up my website behind the scenes to make it more visible during internet searches. My thanks to my buddy Whitknee....you know who you are! It won't look any different to the naked eye but it should bring people more directly to the site. I'm designing a cute email message to send to shops to introduce them to my work. We'll see who wants to carry my goods. Wish me luck. How cute is this heart??? I'm picking up heart beads as I find them figuring that before Valentine's Day there will be a mad rush and higher prices. This one is by Dorrisbeads. So it's back to basics time for me. Several business ideas I had when I began designing jewelry nearly a year ago were put by the wayside and now I see how necessary they are so I'm taking the time to implement them. I'm not making much jewelry for autumn so this gives me the time I need to invest in properly setting my website high on the list during internet searches, getting my accounting in order and stop BUYING beads and use the ones I've had for quite a while! This won't prohibit me from updating www.RockerJewlz.com or this blog, however, so don't think I'm on hiatus by any means. Here comes Autumn so keep enjoying summer days while we've got them. 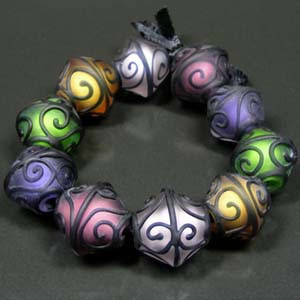 These "lantern" beads by GemFox really do seem to glow! They will be lovely little earrings... perhaps. I've got to get moving as I have two custom orders to finish and a store order to fill for autumn...which is next month. It's hard to do any work since my husband is home on vacation this week. Am I the only one or do some of you need total control of your environment when working with beads or jewelry? I find I go nuts if someone walks in the room or changes anything about my working environment. I get too easily distracted and thrown off course. What a drag. But the trade off this week is that I get lots of kisses and "you sure are pretty" comments tossed my way so it's worth the wait. For ME, anyway, not my customers. So, gotta get movin' and back on track to prepare holiday pieces. I'm pretty much skipping autumn jewelry to give me more time to focus on holiday stuff. I'm nearing the end of my first year at this and finally getting the routine of how far ahead I have to plan and make jewelry for a particular season. That took a long time to get used to. I've had a lovely summer break and now it's time to get back into the thick of it...work, that is. The focal to the left is stunning isn't it? 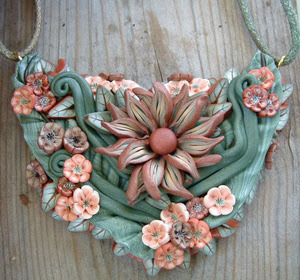 It's by Amy Kuczewski and is on its way to my studio. I can hardly wait to touch it! 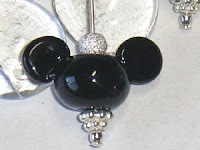 It's tax time for me...first time around...and then it's on to creating holiday jewelry for a couple of stores and for y'all at www.RockerJewlz.com. The Golden Evolution necklace on the home page will also come in black and in red if I can get the beads and will truly "glam" up your holiday attire. This particular necklace is taking me more in the direction I was headed for when I started RockerJewlz jewelry design...Hollywood Glam, so come back for more. My jewelry is moving from Lightning Joe's Guitar Heaven to Posie's in Arroyo Grande village so be sure to visit this heavenly shop to purchase your RockerJewlz jewelry. Posie's is the place for finding just the right gift for anyone for any occasion. 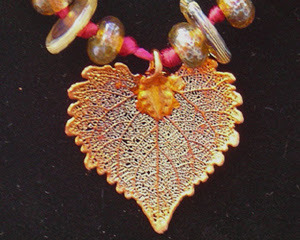 I'm getting ready for autumn by turning my attention to working with colors in the golden and red/orange hues like the "Golden Evolution" you can see on the home page at http://www.rockerjewlz.com/. Next month is August and as soon as I finish up the autumn pieces, I can start on the more glitzy jewelry for the holidays which are my favorite pieces to design. More Hollywood style, you know? I know, I know, you've been wondering where the heck I've been! Busy is all I can say, but a good busy. I've been enjoying traveling more to see family which is always good. But mainly there is an evolution happening within me. My jewelry style is growing and changing into more glamorous pieces so that opens the question "where is the market" for it. A whole new challenge there. Plus since I'm venturing into retail stores, the calculation of price points is completely different than selling via my website so I'm figuring all that out. And I haven't even touched winery tasting rooms yet...I need to clone myself to handle all this! More ideas takes more organization and planning and time to carry out. I'm not complaining though, just rather overwhelmed...but it's a joyous reason to be overwhelmed as it means my brain isn't freezing up...it's moving ahead and figuring it all out. The most intriguing development is the desire to venture into more areas like ornaments and small home decorations which means more mediums...I keep thinking of using feathers and tassles....hmmmmmm. Stay tuned for the results! I'm glad for a big break from all this brain activity next week when I get to babysit my marvelous nephew where my biggest joy will be watching how his 18 month old brain progressively masters techniques of playing and learning....on his own! He's just fascinated with learning something new and then he heading right into repeating it until it becomes natural and easy. He's a self motivator at this age...awesome! 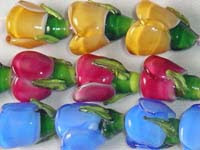 These spectacular polymer clay 1 inch pillow beads are by an Israeli artist. They take my breath away...and that's just in the photo! I haven't received them yet and I can only imagine how incredible they will be in person. I'm just plugging away at custom orders right now. Thanks for visiting. 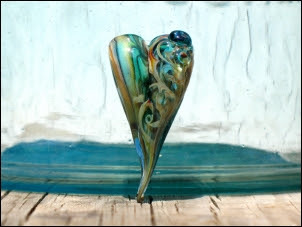 Such a pretty handmade heart by LittleCrow Glass Art. I only added a tiny bit of silver to complete this necklace since the heart is quite spectacular on its own. I'll be visiting shops next week and realized I had very little jewelry of my own, so I've pulled out a few focal beads from my personal stash and am working them into pretty pieces to display my talents to the shop owners. I'm also dropping off more jewelry at Lightning Joe's so if you are in San Luis Obispo county anytime soon, stop by their shop in the Arroyo Grande village to see my current pieces on display. It will be nice traveling for business...haven't done that in a while. I created this new banner for display on voting sites. 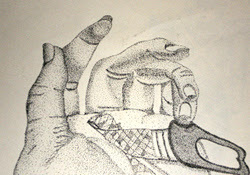 When a viewer votes at the bottom of my home page, RockerJewlz moves up the list that shoppers use to find new artists. It's great exposure and only takes a couple of clicks for the viewer to vote. I appreciate all the votes. There's a beautiful, sparkly green and yellow "Lemon Lime" bracelet on the home page this week. You'll also find an incredible wine stopper on the Extra! Extra! page. Today I'm working on a special order for Angie and then am off for the weekend. Hope yours is cool and lovely. Whew! Busy week. 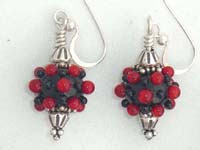 I've added quite a few earrings to www.RockerJewlz.com: Fresh picked Red and Black berries, Pink Lemonade and a wonderful bracelet with small beads called Ocean Ink. And I'm finishing up an order for lots of earrings that will be delivered to the gift shop at Lightning Joe's Guitar Heaven. I'm also preparing an introduction of my work for winery tasting rooms. It will be interesting to see what the response is to them possibly carrying my jewelry. A couple of voting boxes have been added to the home page. In just a couple of clicks, you can help make RockerJewlz known to the shopping world. My friend Cindi tells me that when she was there last, I was at the top as the featured seller...cool. I enjoy manipulating my website more than I ever imagined. I have to pull myself away to actually make jewelry! I freshened my website to bring you bright colors, easier navigation and larger product photos. I had so much fun doing it all that I stayed up until sunrise...I couldn't stop after discovering all the nuances on my control panel. Now, is there someone out there who doesn't like chocolate? 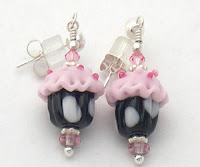 I posted lots of new sweets...cupcake earrings, and amazing tulip sets. And wait until you see what Mickey and Minnie are doing! So, go shopping and freshen up your wardrobe with chocolate, pastels and flowers. What more could a girl ask for? Come see it all at www.RockerJewlz.com. Spring is busily blooming across the country and I have gathered fresh, light colors in jewelry that will brighten your life and pull you out of winter. 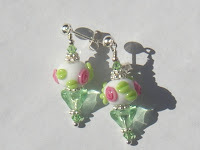 The pink, green and white in "Springtime Roses" (left) join a smorgasbord of delight that includes Mickey Ears, plenty of pastel cupcakes and three color choices of elegant tulip jewelry. You might even find a few black and red berries, but I'll keep you suspense on that for now. Youll find it all on Monday, April 30th at www.RockerJewlz.com. For Mother's Day and general springtime jewelry, instead of the usual bouquet of flowers, RockerJewlz has tulip pendants with matching earrings in Red, Blue and Yellow. 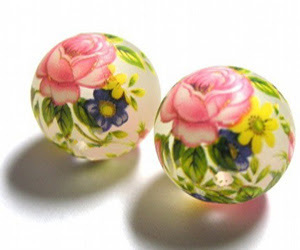 These are amazing little beads about 15mm long and 11mm wide which is the perfect size to remain delicate but still pack a punch. Fascination will draw people closer to you when you wear these. They are currently in production at www.RockerJewlz.com and will be posted for sale this Monday, April 30th.